The word is that it was shut down by the health department in some sort of retaliation for an underground restaurant project called “Gypsy“. Let’s hope this is just a speed bump and not a dead end for delectable locally cured meats. Further details in the original “Swinery shutdown” post at Devouring sEATtle. Thanks for the tip, Anita! The Swinery brings home the bacon — again! Meats galore. Photo by Timothy Vollmer. After selling a half-ton of bacon in less than one day, The Swinery at Culinary Communion announces another half-ton currently curing will be available later this month, just in time for the holidays! You can pre-order on their new Swinery website, and they’ll even deliver orders of 50 pounds or more. If bacon’s not your thing (what??) 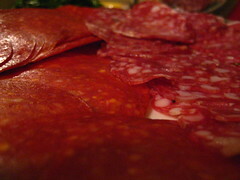 they’re also offering other meats, from duck to veal to pancetta. And they’re looking for contacts that can help them get their delectable wares into farmers markets around town. Let ’em know if you can help out. Half a ton of world-class Swinery bacon — cheap! Photo by Craig Allen. Mmmm... Schweinfleisch! We mentioned the coming of The Swinery from Culinary Communion previously. Bacon Fundraiser at Culinary Communion! 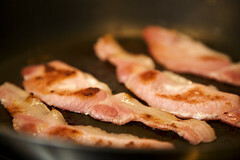 Calling all friends of Culinary Communion, bacon lovers and foodies alike, we need your help! We need to move 1,000 pounds (yes, you read it right, 1,000 pounds) of bacon. It’s a long a story . . . but, in order to secure permitting and to start selling at farmer’s markets in 2009, the city needs to do one final inspection of our new space and 1,000 pounds of our house-cured, incredibly delicious bacon is standing in the way! So, we need you, your friends, family and co-workers to buy our bacon! Selling for only $10/lb., our famous bacon is made from 100% organically-raised Berkshire heirloom pork and cured on-site at the CC house. It has been gaining considerable acclaim all around the city and you will see why when you taste it! Plus, what better time to have a couple pounds of homemade bacon on-hand. Think: Thanksgiving stuffing, weekend brunch, hostess gift or freeze a bunch to use throughout the year. This is an opportunity not to be missed (and a great way to support a local business during these crazy financial times)! Thanks in advance for helping us making our goal of selling 1,000 pounds of bacon a reality! Who knows? Maybe we’ll even make the Guinness Book of World Records . . . Most Bacon Sold in Least Amount of Time! Our very best to all of you this Thanksgiving. We are thankful for the continued support you’ve given us over the years and the enthusiasm and excitement you’ve shown for our new endeavors. Thank you for being a part of it! Stock up and save! Makes a great Christmas gift! Random bolding mine. Thanks for the info, Chris!